BEIRUT: Lebanese Forces leader Samir Geagea and Free Patriotic Movement leader Michel Aoun announced Tuesday a thaw in the bitter rivalry that has plagued ties between the rival groups, following a rare meeting that saw the announcement of a highly-anticipated declaration of intent. Bitter rivals whose leaders engaged in a bloody conflict in the final year of Lebanon’s 1975-90 Civil War, the LF and FPM have held a series of dialogue sessions over the past six months which culminated in the official announcement of a declaration of intent, outlining points of agreement between the parties on certain key issues facing Lebanon. The highly-anticipated meeting, Geagea said, is not the end of dialogue but the start of a new relationship between the two rival parties. He said the declaration of intent wasn’t easy to reach but noted that it reflects the positive dynamic that is starting to exist between the two parties. Aoun also spoke briefly after the meeting, saying that Geagea’s surprise visit crowned a phase that some people say has taken too long to reach. A meeting between the two party leaders was seen as possible crucial step to ending the country's year-long presidential impasse. 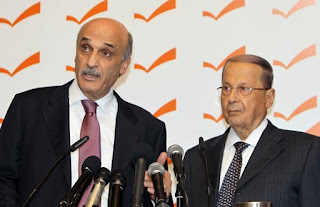 Both Aoun and Geagea are candidates, but neither has been able to garner enough parliamentary support to win. Though it may reduce tensions, the declaration is unlikely to change the political alignment of either the FPM or the LF. 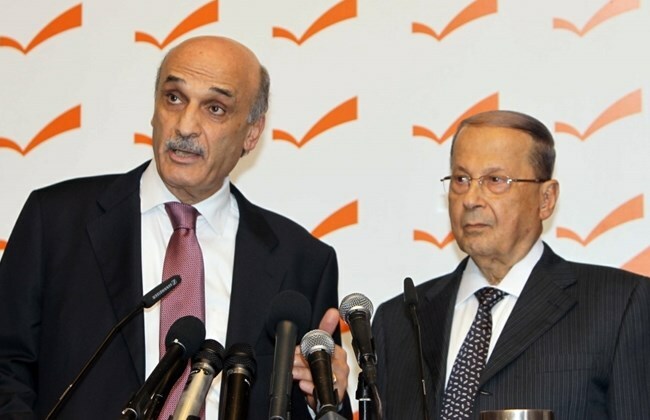 Geagea’s presidential candidacy is backed by the March 14 coalition, while Aoun’s is supported by the March 8 alliance. The two parties also disagree over the legitimacy of Hezbollah’s arms and have diverging stances on the ongoing conflict in neighboring Syria, among other issues.